A green awning above the purple door frame marking the entrance to a small Short North mechanic says “AUTO CARE” in bold white letters, but the “alternative” hinted is only apparent after stepping inside. Alternative Auto Care operates on the automotive expertise of women. Just inside the door, service manager Heather Murphy answered phones and customer questions in the tiny office, which also serves as the waiting room. In the back, Jenni Hoover played Amy Winehouse songs while working on a customer’s 1986 Plymouth Reliant. Owner Chris Cozad checked on her technicians and chatted with customers, who can take home a complimentary bag of Cozad’s white-chocolate Chex mix or a treat for their dogs. Both the makeup of her auto shop — all four of her employees are female — and the personal attention are part of Cozad’s mission to flip the script on what customers expect from automotive technicians. Which, she said, is that their mechanic will take advantage of them. In Alternative Auto Care’s first years, women made up most of the customer base. Now, it’s an even split between genders. Many Ohio State students also take their cars to Cozad and her team. Cozad, who is lesbian, also works to make LGBT people feel welcome. No one, Cozad said, wants to be talked down to or muscled out of the way when it comes to a car. “I like to give women who are interested in the field an opportunity to learn and work in the field without having to deal with some of the crap they have to deal with in a mainstream shop, when they’re the only woman, (like) the subtle discrimination (and) the sexual harassment,” she said. 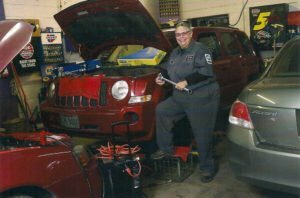 Jenni Hoover has worked as a technician at Alternative Auto Care on and off for 25 years. In between, she worked as a heavy-machine operator on an all-male crew, where she endured constant harassment. “I broke down and cried so many times,” Hoover, 50, said. Women comprise 1.4 percent of working auto technicians, making recruiting new workers difficult. Cozad teaches automotive technology classes at Columbus State Community College and scopes out potential employees (including current technician Jossalynn Burrell). In an industry struggling with high turnover rates, most members of the Alternative Auto Care crew have worked there at least five years. She treats her employees right; they treat the cars and the customers right. Simple, Cozad said. Also simple: the drive fueling her through her 35 years in the auto-care business. While attending Hiram College in northeastern Ohio in the late 1970s, her beat-up 1969 AMC Rebel continually broke down when she was too strapped for cash to take it to a shop. A mechanic friend taught her the basics — changing the oil, recharging the battery, regulating the engine’s temperature — to keep her on the road. When she moved to Columbus in the early 1980s to pursue a master’s degree in biology at Ohio State University (she didn’t attend), Cozad needed a job, fast. Friends started calling her to repair brakes or change oil several times a week. Her new career was written in the headlights. Cozad rented a one-car residential garage, which housed her business for the next three years. “It didn’t have heat or water, but it had a roof and electricity, so, progress,” Cozad said with a laugh. She hired her first employees — all have been women, save for an occasional male through the years — after moving to her first legitimate garage, in the Harrison West neighborhood between Grandview Heights and the Short North, where she remained for 20 years. Cozad moved slightly east to her current location, at West 5th and Hunter avenues, 11 years ago. Spending much of her life under jacked-up cars would have surprised her younger self, but Cozad is thankful that the alternative existed for her.